These surveys are typically flown with our customized, robust, low-flying and safe Air Tractor magnetic gradiometer systems for maximum efficiency, endurance and top of the range ultra-high resolution geophysical data. Because spatial resolution and signal to noise ratios improve dramatically when flying height is reduced, low-level data provides significantly more detailed information for kimberlite detection, base and precious metal exploration, litho-structural and geo-hydrological mapping, and mine planning or sterilization mapping. The survey height is generally only limited by the height of the vegetation and the presence of man-made features such as power lines, buildings and antennae. We believe that it is better to fly regional surveys with top quality high-resolution sensors at a relatively low flying height in order to get the best possible quality profile data that can easily be upward continued or filtered to produce smooth regional grids, while allowing subsequent higher-resolution fill-in work between flown lines at the lower altitude to save costs. In addition to the specialized field of high-resolution magnetics, radiometrics and EM, Xcalibur uses the twin turbine Islander aircraft to provide regional gravity, magnetic and radiometric surveys. Large-spacing tie-line surveys have also been flown with multiple base stations and ultra-long continuous lines to tie in different historical and industry airborne survey data sets, such that flown for the Botswana government over the whole of Botswana on a 10 km grid. 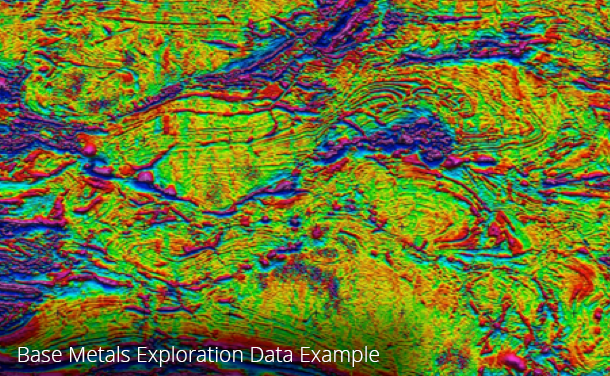 To image intra-sedimentary structure in map view to complement (2D) seismic data. Reveals previously unrecognised faults and enables more confident mapping of known trends (basement and sedimentary). Inexpensive and fast acquisition rate and processing turnaround.